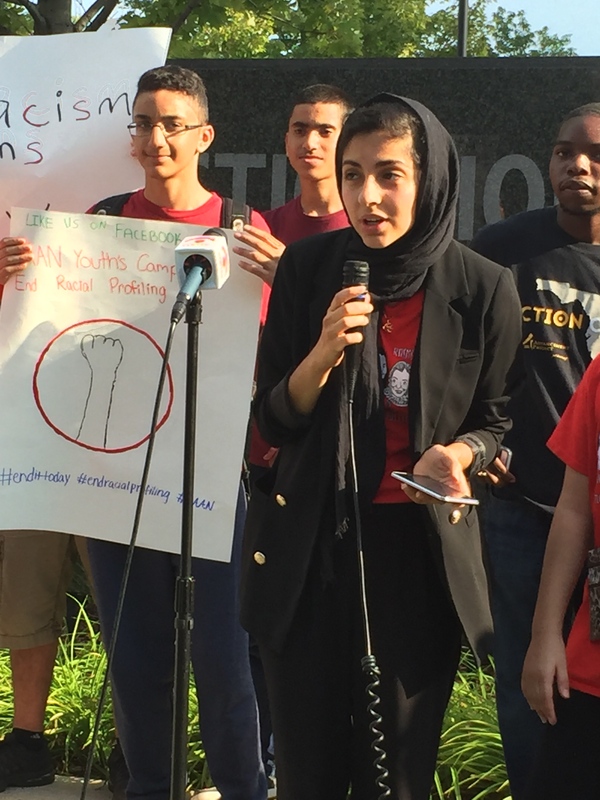 Arab and Muslim youth deliver anti-profiling campaign letter to FBI Headquarters. 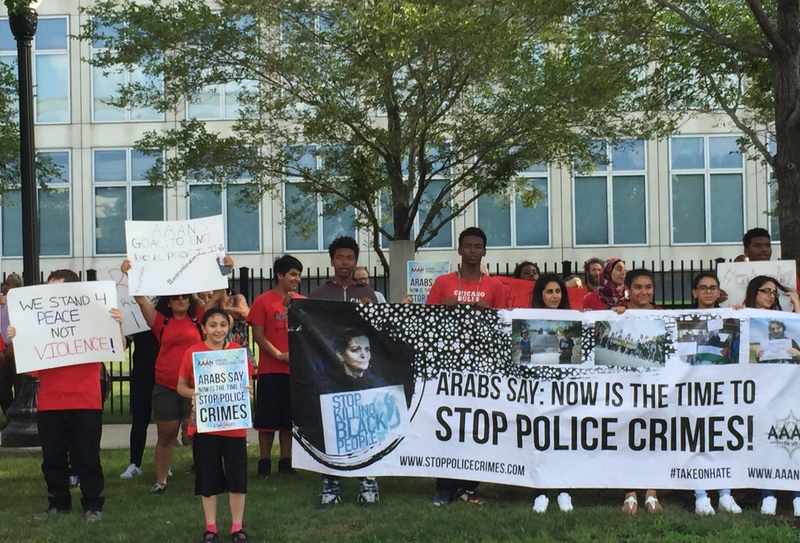 With 50 supporters from multiple activist groups, members of the Arab American Action Network’s (AAAN’s) Youth Organizing Program delivered a letter to Michael J. Anderson, Special Agent in Charge of the Chicago Division of the FBI, and held a press conference, on Thursday outside the gates of the FBI Headquarters on Roosevelt Road. 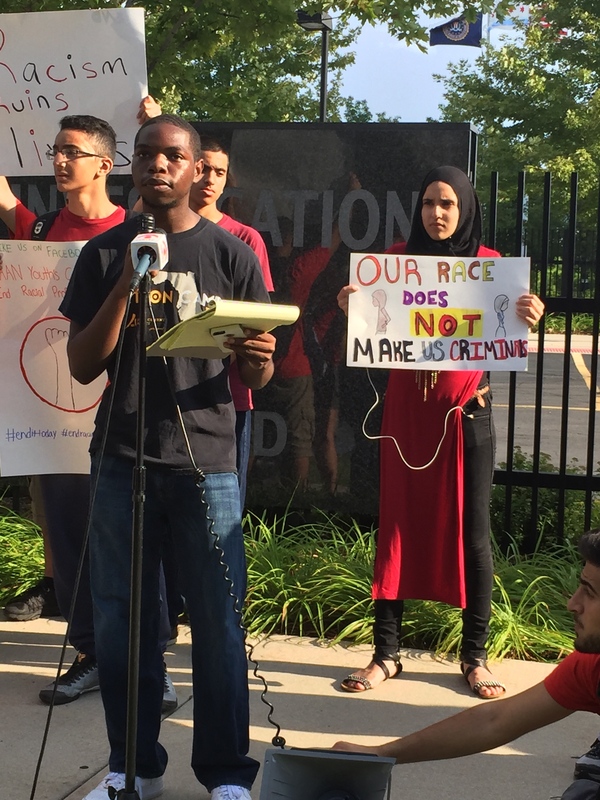 The letter demands an end to the FBI Chicago Division’s policies of racial profiling, including the use of Suspicious Activity Reports (SARs) and undercover informants, and the unveiling of the Countering Violent Extremism (CVE) program. 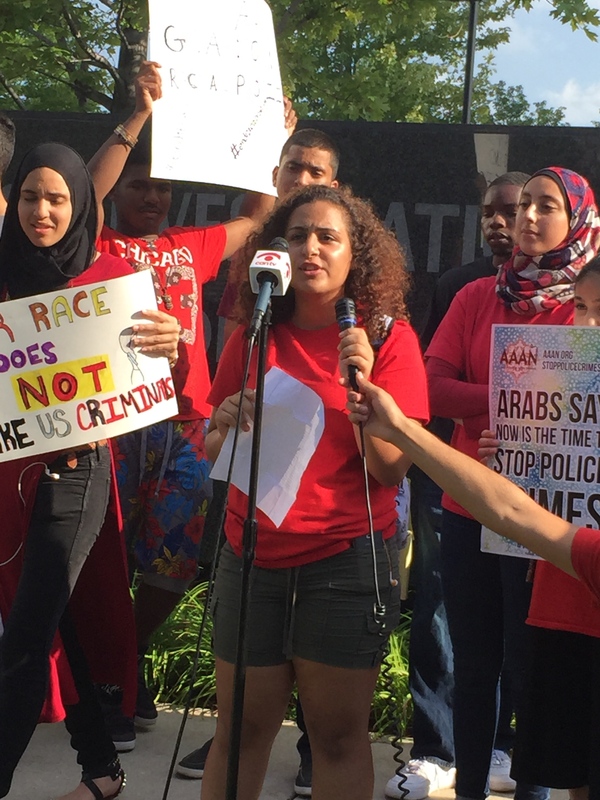 This was the latest action in the AAAN’s four year Campaign to End Racial Profiling against Arab and Muslim communities in Chicagoland. 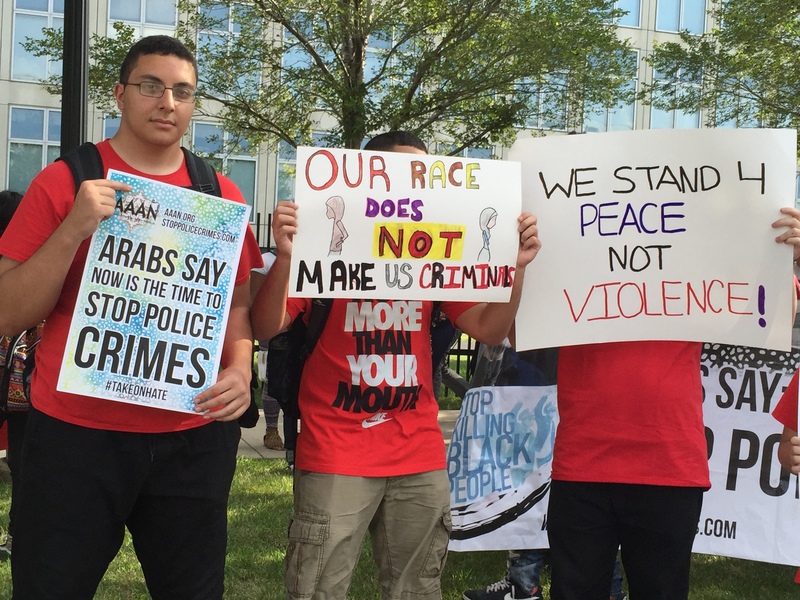 “Every minority in America is treated like a problem long before they are treated like a person,” began a member of the Arab American Action Network’s (AAAN’s) Youth Organizing Program at the community launch of the campaign in August of 2015. During the summer of 2012, a small group of youth at the AAAN was determined to begin a community-based campaign to put an end to racial, national, and religious profiling by law enforcement, which saw a sharp increase subsequent to the events of 9/11. The youth of the campaign conducted surveys, data analysis, and extensive research, and built alliances across racial lines with other organizations, communities, and youth to further their ultimate goal of equality and justice for all. The group held a their first protest in 2013 outside of the Chicago headquarters of Immigration and Customs Enforcement (ICE). The AAAN youth publicly and officially launched the campaign at the community town hall meeting in 2015 that attracted 175 people. At that meeting the AAAN Youth were joined by a guest panel discussion including Veronica Morris Moore from Fearless Leading by the Youth (FLY) and Idalia Cervantes from the Illinois Coalition for Immigrant and Refugee Rights (ICIRR). At that time, the surveys had been returned and initial analysis of the data had begun. Between August of last year and Thursday’s delivery of the letter to FBI Headquarters, the AAAN Youth had completed multiple FOIA requests to gather additional information on SARs and the Countering Violent Extremism (CVE) program had been introduced by the Obama Administration in December of 2015. The demands contained in the letter are based on the results of the community survey of over 450 Arab and Muslim residents within Chicagoland, which detailed their experiences with different levels of law enforcement. The survey found that 1 out of 10 community members who responded had been visited by the FBI, and 85% of those visited had been asked questions about their religion, national origin, political beliefs, or immigration status. These and other statistics from the survey results suggest a FBI policy of singling out Arabs and Muslims for hyper-scrutiny, through policies and programs like SARs and CVE. The letter, reproduced below, written by members of the AAAN’s youth organizing program and signed by a number of allied organizations (American Friends Service Committee, Chicago Alliance Against Racist and Political Repression, Assata’s Daughters, Korean American Resource and Cultural Center, Chicago Desi Youth Rising, and others), was hand delivered to the guard at the gate of the fortress-like FBI building. The protesters were told that the letter would be given to Anderson, but they were not allowed into the building. The press conference held on the sidewalk just outside of the gate included AAAN youth leaders and members of the Chicago Alliance Against Racist and Political Repression CAARPR), the Bluest Lie Collaborative, and others. After the delivery of the letter, AAAN youth leader Razan Khalil began the press conference with a statement from the AAAN Youth. Hoda Katebi, Communications Coordinator from CAIR-Chicago, connected the Youth Campaign against Racial Profiling to the wave of Islamophobia in the country. 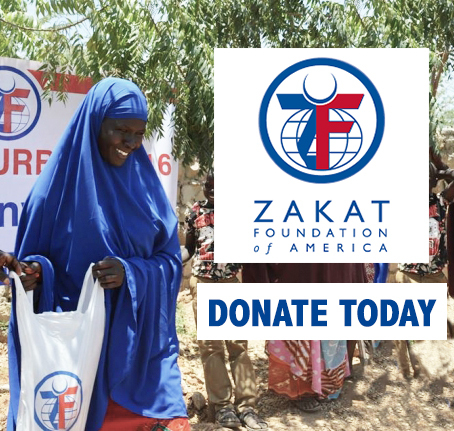 Katebi describes how the targeting of Muslim communities is just part of a system that negatively impacts countries in the Middle East, refugees, as well as Muslims here in Chicago. Brown went on to challenge even the justification for the Blue Lives Matter ordinance itself. The youth-led campaign has already produced three videos. The campaign has also started a Facebook page. 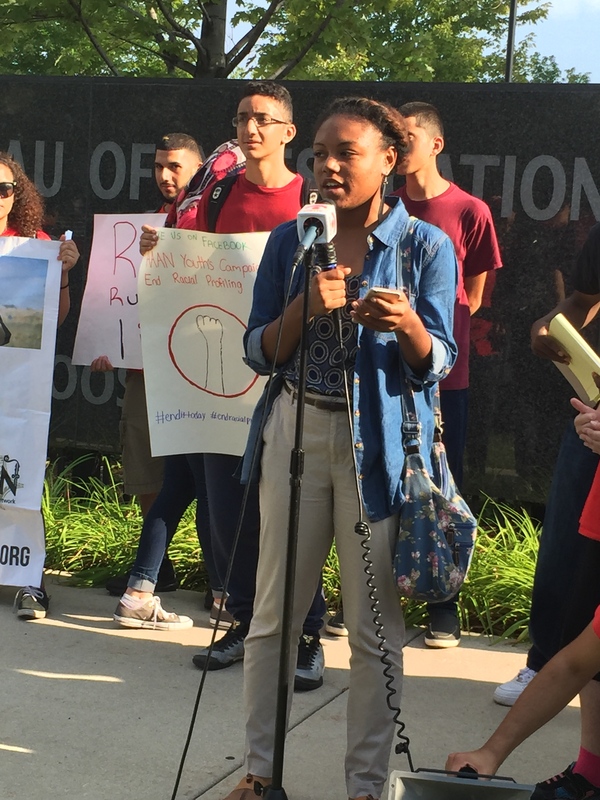 The AAAN Youth leaders said that if they don’t hear back from Special Agent Michael Anderson, they plan on continuing to protest and demand the end of the use of SARs by the FBI Chicago Division, and that the Chicago office refuse to be part of any Countering Violent Extremism (CVE) programming. The complete letter and organization endorsements. 1/3 of community members surveyed believe there are confidential informants within the Arab and Muslim communities of Chicagoland. 17.5% of community members reported experiencing hardship after an interaction with law enforcement (including financial difficulty, needing to move, and even divorce). We also recognize at the time of writing this letter that the Movement for Black Lives in this country and city is at its peak. The hyper-surveillance of Arab and Muslim communities by the FBI cannot be separated from mass policing, mass incarceration, and killing of Black people by the Chicago Police Department and law enforcement agencies across the country. We write this letter officially calling for you to publicly declare the end of the use of SARs by the FBI Chicago Division, and that your office will refuse to partake in any CVE programming. Next articleIs Chicago Really a Green City? Male blacks between the ages of 16 and 30 make up just 3% of the total population of the U.S , yet they account for over 50% of ALL murders and ALL violent crime in our country. – – Maybe you can keep fooling the liberals, but the rest of this country is sick of the lies and the excuses for the criminal THUGS destroying our communities.